From the Creators of the award-winning steampunk Ministry of Peculiar Occurrences series comes a collection of new adventures from around the world. 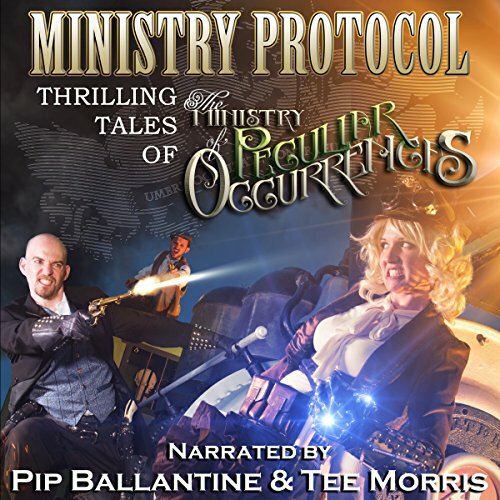 The Ministry of Peculiar Occurrences investigates the bizarre and unusual, and protects the citizens of the Empire from forces of darkness. Every agent knows that thrusting themselves into danger is part of the job, and may demand of them the ultimate sacrifice. They call on their own inner strength, wits, intellect, and innovations of science and technology. But is it enough to face the unknown and the unexplainable? Travel to the farthest corners of Queen Victoria's mighty empire and back again to the shores of Old Blighty, unlocking the mysteries of legend, lore, and shadowy societies. Welcome to a world of steam, secrets, machinations, and madness. Fun stories that nicely round out the steampunk world created with the series but the narration is off. The pacing was disjointed & the range of characters were limited. Might be a better read than listen. Turns out not a fan of the two authors as narrators. I really enjoy this series but the narrators (authors) is less than stellar. Wish they would have used the original narrator from the main series. The stories themselves were interesting, backstories always intrigue me, but many were ruined by the narration; specifically the portions performed by the male narrator. I'm sure he did his best, and was better than I could ever be, but he should stick to writing. The female narrator was much more enjoyable to listen to and as a result the stories she read were more interesting and kept my attention better.